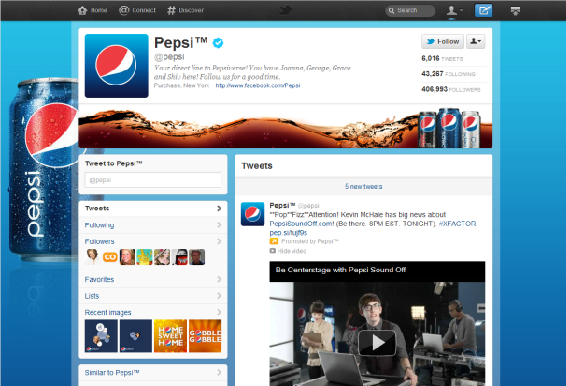 After being left behind by Facebook and Google+, last Thursday Twitter officially announced the launch of brand pages. Designed to strengthen their relationship with advertises, brand pages are accompanied by a wider user interface redesign and offers a number of useful features that will no doubt improve Twitter’s attractiveness to brands that are utilising social media. Facebook has long held the number one position for brands looking to branch into social media. It’s a trusted well established site with over 800million uses and offers useful features such as the ability to hide content behind a ‘like’ wall, comprehensive user statistics and support for apps and other page modifications. Google+ only recently launched their brand page service. Considered by many as a sleeping giant this service offers only basic profile modification above stock individual pages and a smaller user base than competitors, but given the push Google is applying has the potential to evolve significantly. Finally we have Twitter. Prior to launch Twitter only offered the same basic page to all of its users whether they are individuals or brands. This launch sees brand pages now able to distinguish themselves through three key areas. First is an expanded and fully customizable header image area which brands can now use to display their logo and tagline more prominently than the current offering. Second is the “featured Tweet” area where brands are able to highlight a specific Tweet. This allows the ability to extend a Tweet’s shelf life for much longer than previous and also auto expand content such as an embedded photo of video. Third the ability to separate @replies from @mentions will allow brand page managers to streamline their communication and reduce other Twitter noise. Example of a new Twitter brand page; custom art headers and option of pinning an update with picture at the top of the tweet stream. While initially rolling out to only 21 accounts including; Coca-Cola, Nike, Dell, American Express, McDonald’s, Best Buy, Subway, JetBlue, and Heineken this update will make its way through to more businesses in the New Year. At this stage it is difficult to predict the impact that this will have on the social media landscape and choices available to business, but one thing is certain with the three major social networks now competing in this area we will be sure to see more innovation and new features specifically for business available in the coming months. The other day, I finally (and accidentally) discovered how Twitter can be useful for me personally. It all started on a cold, blustery Tuesday…. I was anxious, because my new addiction, Master Chef, was clashing timetable-wise with my pre-paid tickets to the Lily Allen concert in Sydney. I wanted to get to Lily Allen fairly early, because with no assigned seats, I needed to ensure I could sit down and wouldn’t have to stand with the teeny boppers. Problem was, it was celebrity chef night on Master Chef – I didn’t want to miss it! Would Lucas get through? Sitting in my seats at the Hordern pavillion at 7:30 I was glad I got there early to bags seats with the other ‘adults’, but I was also dying to know who won Masterchef. A quick look on my friends iPhone solved all my worries, as people were tweeting just seconds after Lucas’s victory. Admittedly I could have waited till it got onto the MasterChef website, which would not have taken much longer, but such is the ‘youth’ of today. We want it all, we want it now, and in two seconds it will be old news. In such an environment, ‘real-time’ search engines like Twitter might just have a place. Since I am the most impatient of all, I have found a happy use for Twitter. Sure you can’t see the most up to date news unless you know what to search for, but you can see what the zeitgeist is, by looking at the twitter trends. Right now for example, 2 of the 3 most popular twitter threads include Iran (democracy debate), which is heartening, and shows that maybe Twitterers aren’t as shallow as the non-converts might think. This pride diminishes, when you see that the second most popular thread, and the eighth as well, are on ‘John and Kate’. If you aren’t familiar (and I only am because I just stayed with my friend in the US) this is a couple from the US show John and Kate Plus Eight, and they are apparently splitting up. The fact that this gets two spots in the top 10 might insinuate a very large proportion of US users. Another positive thing about Twitter? I only just noticed the new ability to erase Tweets you have written…great addition for those impetuous people out there (like me…).